Fabela-Cárdenas, M. A. (2012). The impact of teacher training for autonomous learning. Studies in Self-Access Learning Journal, 3(3), 215-236. This article focuses on teacher attitudes towards learner autonomy and discusses whether teachers’ attitudes change through teacher training. The study was carried out with teachers working in different self-access centres within the State University of Nuevo Leon, Mexico (UANL). The aim of the study was to report any changes in teachers’ opinions and beliefs on issues after a teacher training course. These issues range from teacher-centeredness, learner-centeredness, learner autonomy, work in the SAC, views on language learning, the role of teachers, the role of learners, views on local culture, and on motivation. The study was carried out using Q Methodology. Keywords: Self-access, autonomous learning, learner training, learner autonomy, teacher autonomy, teachers’ attitudes. The last two decades have seen an increase in the development of self-access language learning centres around the world. This has promoted an interest in learner autonomy and best practice to promote it. Practitioners and theorists in the field seem to agree that in most schemes for learner autonomy, teachers still play an important role helping the learner develop autonomy (Benson, 2007; Sinclair, McGrath & Lamb, 2000; Nakata, 2011). Autonomous learning has become the umbrella term for an approach that envisions giving learners more autonomy in their decisions about what, when and how to learn. Holec (1981) introduces the idea of autonomy and separates directed-teaching from self-directed learning, presenting a theoretical and practical description of the application of the concept of autonomy in language learning by adults. In order to do this he introduces specific techniques that learners would need to acquire in order to develop autonomy. In order to help learners assume more responsibility to control their learning and to make all the necessary decisions, it was suggested that learners needed learner training to analyse their needs, identify their learning styles, make use of appropriate learning strategies, establish goals, monitor their progress, and self-evaluate (Ellis & Sinclair, 1989; Holec, 1981). Little (1995) suggests that if the ultimate and only purpose of learning a language is using that language, practitioners should bear in mind that the social dimension of learning and using a language calls for a more collective, as opposed to individual, effort for learners to develop autonomy for learning. Little’s contribution helped the profession to see autonomy from a different perspective where indeed, the textbooks, the curriculum and the teacher still played a role in shaping and balancing autonomy while also providing the social opportunity for maximal self-development within human interdependence (Little, 1995). However, it was suggested that in situations where learner autonomy and self-access learning are totally new concepts, it may be difficult to encourage learners to move away from the traditional approaches with which they are familiar, and that is a reason why “Learners need to be exposed not only to self-access learning but also to information about how it is different and why” (Gardner & Miller, 1999, p. 12). It becomes evident that what is applicable to learners is applicable to teachers too. Teachers might also find it difficult to move away from the traditional approaches; therefore teachers as well as learners need to be exposed to autonomous learning and self-access learning in order to be able to make sense of it. In consequence, there has been an increasing interest in focusing on the role of the teachers and their own development through teacher education (Sinclair, McGrath & Lamb, 2000) and it has become important that teacher training mirrors learner training. Within the field of English language learning, the roles of teachers in promoting learner autonomy have been examined in specific contexts (Benson, 2007; Chan, 2003; Holec, 1981; Lamb, 2000; Nakata, 2011; Sinclair, McGrath & Lamb, 2000; Reinders & Lazaro, 2011; Smith, 2000; Voller, 1997; Yang, 1998). As we have increasingly adopted this pedagogy, we have been in need of organising teacher education that helps teachers to cope with their new roles and demands. How should this teacher education be? Aoki (2002) agrees and suggests that teacher education for the development of teacher autonomy needs to be flexible in order to grant freedom and room for choice, to be psychologically supportive for personal growth, and to allow mutual trust between student-teachers and teacher educators. It has also been pointed out that not all teachers, just as not all learners, are at the same level of autonomy. McGrath (2000, p. 109) distinguishes two broad perspectives on teacher autonomy: (i) self-directed professional action and (ii) freedom from control by others. He also argues that we cannot assume a readiness on the part of teachers to exercise autonomy in any of these ways and reports that in a course on materials design and evaluation, some teachers were found to be at different stages of this continuum; ‘some were developed and independent enough to tackle action research projects, some could develop this capacity without intervention, and some were at a very early stage of teacher autonomy – conditioned perhaps by either cultural or curriculum constraints. In many contexts, including the context of this study, teachers might opt for accepting the decisions already made by others because this seems to be less demanding in every aspect. Such teachers obviously have not developed their own autonomy. McGrath (2000) suggests that exercising independent judgment about the decisions made by others (e.g. on syllabus, examinations, textbooks) requires compromise and negotiation as well as determined autonomous action, but that not all teachers demonstrate the capacity and freedom for self-direction. This is important, as Benson (2000, p. 117) argues ‘the ability of learners to exercise their rights depends upon the extent to which teachers are prepared to exercise their own right to autonomy’. In that sense, Benson suggests that teachers have to be able to explore the boundaries of their institutional constraints (e.g. the curriculum) which should not be difficult if, as Little (1995, p. 178) explains, every time a teacher presents a curriculum s/he does it from his/her own unique interpretation of it. In a similar vein, Voller (1997, p. 111) argues that the role of the teacher as a negotiator and/or mediator is key to allow learners to gain some control over contexts otherwise controlled by others (e.g. authorities, curriculum, etc). However, as Smith (2001) points out, we may need to acknowledge and try to address constraints on our own autonomy as teacher educators in relation to being self-directed professionals, being self-directed learners and being free from external control. McGrath (2000), like Little (1995), proposes a teacher training programme where the message and the medium are one and argues that participants will experience a level of uncertainty that is generated in the practice of autonomous learning, and which they must confront in order to emerge convinced to implement autonomy in their own classrooms. This approach, according to Little (1995, p. 180), will never be “entirely comfortable or entirely successful” but it will give trainers and trainees the opportunity to sense the uncertainties generated by surrendering control and will compel participants “to be more than consumers of ready-made courses” (p. 80). Little argues that those who succeed will be more coherent in their day-to-day interaction with their learners. Some interesting ideas for teacher education and teacher development are proposed by Lamb (2000), including: the need for reflective practice, the need to relinquish control in the classroom, the integration of peer-assessment, peer-appraisal and mentoring, and the consideration of teachers’ personal theories and beliefs given that their beliefs might influence whether they promote autonomous learning or not. This implies that in every university there might be lecturers who are more or less inclined towards favouring learner autonomy and this study explores whether teachers change their attitudes after a teacher training course that takes into account recommendations from the literature to mirror teacher training with learner training, a course that is co-produced by trainer and trainees, who jointly decide the aims, the course content and the learning activities. The study explores my own environment in relation to teacher training and its effects on teachers’ attitudes. It was carried out with twelve teachers working in different self-access centres (SACs) within the State University of Nuevo Leon (UANL), Mexico. The SACs in the UANL offer two modalities of English learning for students. The first is autonomous learning with guidance from a tutor in the SAC and the second is a blended mode of classroom sessions plus autonomous learning in the SAC. These teachers work in one or both of these modalities. The participants in the study are 12 teachers, all of whom are Mexican. They represent ten different schools, including four Preparatory Schools and six Faculties. Their ages range from 22 to 55, while their experience in teaching ranges from one year to 30 years and their experience in SACs ranges from one month to three years. There are two men and ten women in this group of teachers. These 12 teachers had shown two main attitudes that had been identified as Directive Teachers and Trusting Teachers in pre-course interviews. The Directive Teachers tended to distrust the students ability for self-direction and the Trusting Teachers were more prepared to share the control and the responsibility for learning with the students (Fabela, 2009). The aim of the post-course study reported here was to explore whether the teachers had been influenced by the experience in the course and whether they had had any changes in opinions and beliefs after a teacher training course on autonomous learning. In order to obtain such configurations, Q methodology interviews are arranged using a collection of opinions or ‘Q statements’ about the topic being researched, in this case, issues of autonomous learning. Interviewees are asked to agree or disagree with the ‘Q Statements’. A Q statement is an opinion or a belief stated in a meaningful sentence and a Q set is the collection of Q statements. The Q set in this study consisted of a total of 44 Q statements. Each participant was asked to rank the Q statements written on cards according to his/her own opinions and score each statement under a scale that varies from two opposite views, for example, ‘I strongly agree with this opinion’ or ‘I strongly disagree’, and sometimes ‘most like me’ or ‘most unlike me’. The level of agreement or disagreement can be represented on a scale from –5 to +5 including zero, where –5 represents a strong disagreement, +5 represents a strong agreement, and a neutral position is represented by zero. The participant sorting the Q statements places every card under the scale, which is normally laid out on a table, thus producing the scores for the statistical analysis. The objectivity of Q Methodology comes from its statistical analysis which provides a systematic way to examine and reach understandings about personal experiences (McKeown & Thomas, 1988). The collection of the Q statements, which come from among all the members in the community, helps in displaying many viewpoints. Through the interviews, the participants express their own opinions based on the Q statements. Normally the Q statements are collected from the discourse of the subjects in the research, from the literature in the relevant field, from newspapers, editorials, articles and books. In this case, the Q statements were collected from the voices of students, teachers, SAC coordinators, and from the literature in the field of autonomous language learning. The researcher designed some of the statements to balance the Q set by trying to make sure that all possible viewpoints were included. The Q Statements for this study and their sources appear in the appendix. An advantage in using Q Methodology is that it can measure the intensity of the beliefs of the participants, possibly shedding light about why some attitudes might be difficult to change. The issues discussed in the Q Methodology interviews pre and post course ranged from teacher-centeredness to learner-centeredness, distributed in seven dimensions: Autonomous learning, work in the SAC, views on language learning, the role of teachers, the role of learners, views on local culture and motivation. The results shown here report on the changes of teachers´ beliefs after the course. The reader will remember that a previous study (Fabela, 2009) reported that the twelve participating teachers had allocated themselves into two ‘clusters of opinions’ or ‘components’. One cluster (formed by teachers T12, T5 and T4) showing an attitude consistent with a Directive Teacher, another cluster (T1, T2, T3, T6, T7, T8, T9, T10, T11) showing an attitude of a Trusting Teacher. This depended on whether they had a tendency towards teacher-centeredness or learner-centeredness and learner autonomy. In order to discover whether teachers’ attitudes change, a learner-centred and learner-directed in-service teacher training course was organised. As suggested by Little (1995), the course was co-produced by trainer and trainees so the aims, contents, process, learning activities and assessment were negotiated. By following the principles for learner-centeredness and autonomous learning, the contents, the processes, and the distribution of the topics for a 20-hour timetable were decided by the trainees with the teacher trainer adopting the role of the facilitator. After the teacher training course, Q sort interviews were arranged and the participating teachers scored their opinions on the same set of Q statements that were used in the previous study (Fabela, 2009). 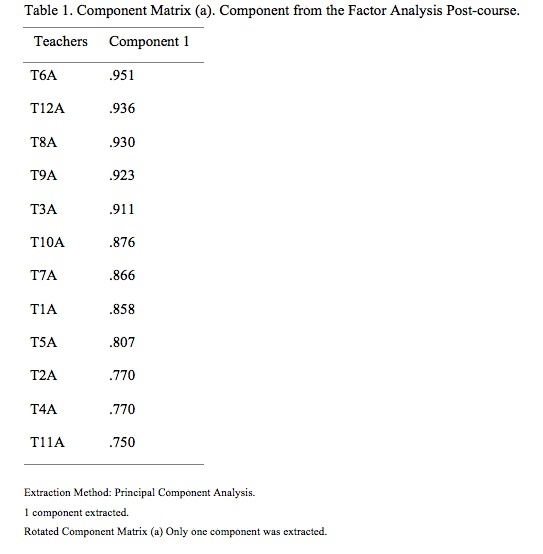 These post-course interviews produced a new dataset for the SPSS Data Reduction and Factor Analysis which are the statistical techniques used in Q Methodology and that, based on the teachers scoring of the Q statements; reveal how teachers thinking similarly will form a cluster of opinion. A teacher belonging to a particular cluster is shown numerically in a significant ‘loading’ or correlation coefficient. A loading is statistically significant if its value is greater than 2.58 x SE, where S. E. is the Standard Error calculated as 1/√N, and N is the number of Q Statements. Since in this sample N = 44, loadings greater than 0.388 are statistically significant. only one component or group, which means that all 12 teachers had similar views forming one cluster of similar opinions. This shows that the division in opinions pre-course had disappeared. A is used for agreement (from 0.81786 to 1.11408), D for disagreement (from -1.5315 to -0.86222) and N for neutral when loadings were low (from -0.60693 to 0.79152). Table 2 shows that teachers agreed that higher education institutions were only one source of knowledge among many other sources but considered that what is done in schools is relevant. It was difficult for them to either agree or disagree if the roles of teachers were paternal and assertive versus fraternal and permissive (see Sheerin, 1989). However, the teachers disagreed that learners are meant to be dependent and thought that learners should be given more opportunities to be independent. They considered that the learners’ work in the SAC can be isolating and frustrating if learners are not supported through learner training and learner counselling and that SACs offer possibilities for students to extend their learning, to practise and to develop responsibility and autonomy. The teachers mostly disagreed that learning should be reproductive but were very tentative about it being totally meaning-based. They disagreed that culture has a hindering effect and agreed that there is a need to be competent in a rapidly-changing world. They agreed that the motivation of the learners will increase when they are given learner training and learner support in the SAC. In summary, the Trusting Teachers group confirmed their views towards learner-centeredness; and the teachers who had been in the Directive Teachers group (T12, T5, and T4) actually changed towards views more favourable to learner-centeredness by adopting similar views to those of the Trusting Teachers. Now, all 12 teachers seem to have understood the principles of autonomous learning. So, how did teachers who had been classified as Directive (Fabela, 2009), before the course, change their views after the training course on autonomous learning? A closer look at their discourse, produced as they interacted with every Q statement, will allow us to understand their thinking. As part of the Q sorting process, teachers were asked to voice their own opinions as they interacted with the Q statements. These opinions were recorded and transcribed and serve to find out what teachers think. Their opinions here are very important for two reasons; firstly, to confirm whether the course had an influence on teachers’ beliefs, and secondly, to confirm whether they are being sincere in their indicated beliefs as opposed to trying to please the interviewer, one of the risks of any interviewing process. This is difficult to know, but the discourse was analysed, teacher by teacher, to try to find contradictions. The transcripts seem to show that teachers returned to their classrooms and SACs to experiment with some of the ideas they had learned from the course, and their attempts, and their reflections on their attempts, seem authentic. Their reflections seemed to confirm the level of agreement or disagreement expressed in the statistical loadings which showed that they all have similar opinions forming only one group, and that after the course the two groups found in the pre-course interviews as the Trusting Teachers and the Directive Teachers have merged into one group with similar opinions favouring autonomous learning. The teachers’ reflections were about: self-direction; the influence that younger teachers had on older teachers and vice versa; the feelings of uncertainty that autonomous learning entails; learning strategies; having a different role as a teacher; an increase in motivation by choosing their own topics in the teacher training course instead of having these imposed; learning pathways; the demands on time and energy that the change requires from teachers; and changing and evolving. T4 about the course: We are not used to such course management, I thought you would bring all the topics we were going to see but this course adapts to our needs, to what we want, and we build it. At the beginning we all wanted to talk about motivation because that’s a problem that we all share and later we saw other topics of our interest and perhaps that brings out more interest than if the topics had been imposed. T12 About the course: From the moment you asked ‘what would you like to do in the course?’, and logically it was the first time [we heard this] and I told my friend ‘I don’t understand what’s happening, she is supposed to be teaching us’ and my friend said ‘I think they are not ready, they don’t know about this course, perhaps they got the date [for the course] wrong, I think they haven’t organised it. But then everything was focused on only one point: autonomous learning; [therefore] the course couldn’t be any other way. T4: Before the course, I used to feel an administrative or a secretary, any other thing but not a teacher, and with the course I realised I could apply all what I learned in my BA and this is something I didn’t feel before taking the course, now I realise that when I develop activities in the SAC I can apply all what I know about the subject. As you said, we continue to be teachers but with a different role. T9 about the course: I plan to implement the idea of the learning pathways. I’ll try to find time to prepare them. I know it is a lot of work but it’s worth it, that’s what I want to do. T5 on Q 13: Well, it is difficult to change and to develop towards autonomous learning but I don’t agree that if we changed we would betray our culture; on the contrary, we would be evolving, so to speak. This section has shown the teachers’ voices about their own beliefs after the experiential training course. Similar to the findings of Kato (2012, p. 86) the interaction of the teachers with the Q statements in the interview process seem “to allow advisors to reflect critically and explore themselves differently in a way which might not take place in an internal dialogue or in casual workplace conversations”. The following section contains some reflections. This discourse analysis, along with the statistical results, seems to show that the teacher training had a positive effect on teachers’ beliefs and attitudes towards learner autonomy. It cannot be claimed that the process of the course went very smoothly as the participants – teachers and educators – experienced doubts and anxieties along the way. During the first two days of the course, teachers were reluctant to take control and the educator had to step in to assist, thus making this course more a combination of methods rather than a purely experiential method. This confirms that teachers, like learners, are at different stages of self-direction as professionals and at different levels of autonomy as learners. Initially they expected the educator to be directive. This was reflected in the results regarding their views about the role of teachers, where they did not seem convinced of the need to move from the paternal, authoritarian role of the teacher to a more fraternal and facilitating role. This could be interpreted as a cultural trait and a legacy that needs to change in the future as teachers gain more self-esteem for self-direction. However the opportunity to co-produce the training course as in learner-centred education helped them be more aware of the processes involved in promoting autonomous learning in their own classrooms. This body of data also seems to show that teachers who had previously shown attitudes consistent with teacher-centeredness changed their attitudes towards learner-centeredness after a training course which was based on the principles of learner-centeredness and learner autonomy, and went back to their classrooms and SACs to try out some of the new ideas. Martha Fabela is a professor at the Universidad Autónoma de Nuevo León, Faculty of Philosophy and Arts. She is responsible for educating student-teachers and in-service teachers in the bachelor and graduate programmes on ELT. Within this university she was in charge of developing 57 self-access centres and training teachers and advisors in their use and operation, and in the provision of services and support for language students. Aoki, N. (2002). Aspects of teacher autonomy: Capacity, freedom and responsibility. In P. Benson & S. Toogood (Eds. ), Learner autonomy 7: Challenges to research and practice (pp. 110-124). Dublin, Ireland: Authentik. Benson, P. (2000). Autonomy as a learners’ and teachers’ right. In B. Sinclair, I. McGrath, & T. Lamb (Eds. ), Learner autonomy, teacher autonomy: Future directions (pp. 111-117). Harlow, UK: Longman. Benson, P. (2007). Teachers’ and learners’ perspectives on autonomy. In T. E. Lamb & H. Reinders (Eds. ), Learner and teacher autonomy: Concepts, realities and responses (pp. 15-32) Amsterdam, the Netherlands: John Benjamins. Chan, V. (2003). Autonomous language learning: The teacher’s perspectives. Teaching in Higher Education, 8(1), 33-54. Chandler, D. (1983). A history of Cambodia. Boulder, CO: Westview. Cotterall, S. (1995). Developing a course strategy for learner autonomy. ELT Journal, 49(3), 219-227. Dam, L. (1995). Learner autonomy: From theory to classroom practice. Dublin, Ireland: Authentik. Ellis, G., & Sinclair, B. (1989). Learning to learn English. A course in learner training.Cambridge, UK: Cambridge University Press. Gardner, D., & Miller, L. (1999). Establishing self-access. From theory to practice. Cambridge, UK: Cambridge University Press. Garton-Sprenger, J. (1990). Training learners to learn. In D. Hill & S. Holden (Eds. ), Effective teaching and learning (pp. 58-63). Oxford, UK: Modern English Publications. Gow, L., & Kember, D. (1993). Conceptions of teaching and their relationship to student learning. British Journal of Educational Psychology, 63, 20-33. Holec, H. (1981). Autonomy and foreign language learning. Oxford, UK: Pergamon Press. Illich, I. (1971). Deschooling society. Harmondsworth, UK: Penguin. Jones, J. F. (1995). Self-access and culture: retreating from autonomy. ELT Journal, 49(3), 228-234. Kato, S. (2012). Professional development for learning advisors: Facilitating the intentional reflective dialogue. Studies in Self-Access Learning Journal, 3(1), 74-92. Lamb, T. (2000). Finding a voice: Learner autonomy and teacher education in an urban context. In B. Sinclair, I. McGrath, & T. Lamb (Eds. ), Learner autonomy teacher autonomy: Future directions (pp. 118-127). Harlow, UK: Longman. Lowes, R., & Target F. (1998). Helping students to learn. London, UK: Richmond Publishing. McGrath, I. (2000) Teacher Autonomy. In B. Sinclair, I. McGrath, & T. Lamb (Eds. ), Learner autonomy, teacher autonomy: Future directions (pp. 100-110). Harlow, UK: Longman. McKeown, B., & Thomas, D. (1988). Q Methodology. London, UK: Sage Publications. Nakata, Y. (2011). 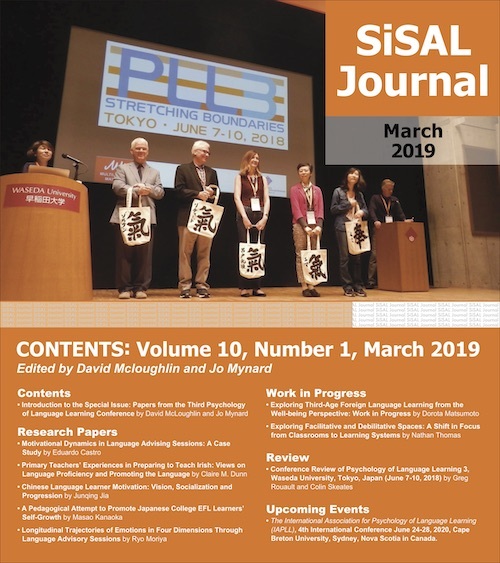 Teachers’ readiness for promoting learner autonomy: A study of Japanese EFL high school teachers. Teaching and Teacher Education, 27(5), 900-910. Reinders, H., & Lazaro, N. (2011). Beliefs, identity and motivation in implementing autonomy: The teacher’s perspective. In G. Murray, A. Gao & T. Lamb (Eds. ), Identity, motivation and autonomy in language learning. Bristol, UK: Multilingual Matters. Sheerin, S. (1989). Self-access. Oxford, UK: Oxford University Press. Sinclair, B., McGrath I., & Lamb, T. (Eds.) (2000). Learner autonomy, teacher autonomy: Future directions. English Language Teaching Review. Harlow, UK: Longman. Smith, R. C. (2000). Starting with ourselves: Teacher learner autonomy in language learning. In B. Sinclair, I. McGrath & T. Lamb (Eds. ), Learner autonomy: Teacher autonomy: Future directions (pp. 89-99). Harlow, UK: Longman. Smith, R. C. (2001). Teacher education for teacher-learner autonomy. In J. Gollin, G. Ferguson, & H. Trappes-Lomax (Eds), Language in language teacher education (CD version). Edinburgh, Scotland: IALS, University of Edinburgh. Ushioda E. (1996) Learner autonomy 5: The role of motivation. Dublin, Ireland: Authentik. Voller, P. (1997). Does the teacher have a role in autonomous language learning? In P. Benson & P. Voller (Eds. ), Autonomy and independence in language learning. (pp. 98-113). Harlow, UK: Longman. Yang, N. D. (1998). Exploring a new role for teachers: Promoting learner autonomy. System, 26(1), 127. Williams, M., & Burden, R. (1997). Psychology for language teachers: A social constructivist approach. Cambridge, UK: Cambridge University Press. Watts, S., & Stenner, P. (2005). Doing Q Methodology: Theory, method and interpretation. Qualitative Research in Psychology, 2, 67-91.